Monday July 9, crews opened access to the one of the new Interstate 94 (I-94) and Sheyenne Street interchange ramps being constructed over the two-year project to drivers. The northwest ramp connection, near the future grocery store site, takes motorist wishing to travel westbound on I-94 to the interstate. Motorists enter the on-ramp at the same ramp access point as the old northwest ramp and then use a temporary asphalt connection to travel to the new concrete ramp. With this new northwest ramp is in use crews will begin removing the old on-ramp to allow for room to build the new loop ramp and additional ramp connection in this quadrant. The new ramp configuration is called a modified single point urban interchange, which will move double lanes of traffic through one stoplight in the middle of the interchange when completed in 2019. Two new loop ramps and 4 additional ramps will be built throughout the project work. 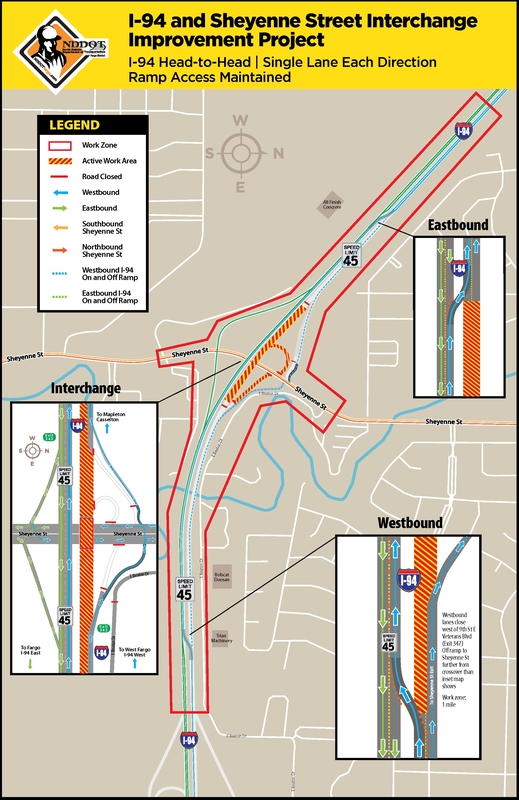 Through the interchange project limits, crews are working on I-94 westbound bridge reconstruction, a new lift station, installing underground utilities, retaining wall in the northeast quadrant of 32nd Street South and Sheyenne Street and embankment areas for new and widened Sheyenne Street roadways. On the westbound I-94 ramp exit to Sheyenne Street crews are also working in the closed north side driving lane to repair sections of deteriorated concrete. Crews will be replacing these sections with new concrete throughout the closure to improve the functional condition and extend the pavements service life. Crews are working close to oncoming traffic throughout the work zone on I-94. Motorists are urged to use caution when driving through the area to exit on to Sheyenne Street. Westbound drivers wishing to exit Sheyenne Street are carried in a half mile lane on the west side. The entrance to this exit is just west of 9th St E/Veteran Blvd exit where westbound traffic crosses over to the east side. A temporary northeast exit-ramp is used to travel northbound on Sheyenne Street while the existing ramp is reconstructed. Eastbound and westbound I-94 traffic is being carried head-to-head in one lane in each direction for about 1 mile surrounding the Sheyenne Street interchange. Interstate traffic will remain in this driving pattern until the first year of work enters winter suspension in late fall. Speeds on I-94 will be reduced to 45 mph on the interstate and 25 mph on the interstate ramps. Flaggers are present around the I-94 bridges as crews work underneath and on the side areas. One of the easiest choices motorists can make as a driver when you enter a work zone is to slow down and stay alert. Never enter a road blocked with barriers or cones. Eastbound and westbound I-94 traffic is being carried head-to-head in one lane in each direction for about 1 mile surrounding the Sheyenne Street interchange.